No one wants to be in the position of going through a car accident, but this situation can go from bad to worse if the other driver is unable to keep his or her emotions under control. If you are trying to do the rational thing and pull over your car to share information and contact the authorities after an accident happens, all of this can become extremely stressful if the other driver is unable to contain his or her anger. Thankfully, there are a couple of things that you can do in order to minimize these feelings and to keep this situation from escalating any further. Be aware that some drivers are simply unable to control their emotions and may even get physical if you do not respond appropriately. One of the most important things you can do is to stay calm and aware of the situation. 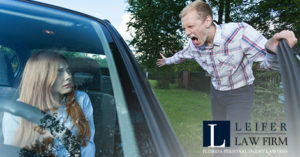 Read on to learn more about some of the best tips to handle an angry driver at the scene of the accident. Getting angry on your own will not make the other driver less angry. In fact, it could make this other person even angrier than before. Staying collected and calm as you speak to him or her and exchange information can help to defray the situation. Be aware that some people will not be able to stay calm even if you are speaking slowly and clearly. They may be extremely angry that the accident has happened even if the accident was their fault. You should avoid taking blame for the accident, but you should coolly collect their information and contact the authorities. If you need to separate yourself physically from the other driver, take a couple of steps back. There is nothing wrong with prioritizing your own safety and comfort in this situation. If the other driver is unable to calm down, it is better to let the police speak to him or her and collect the relevant information. Listening to the other driver can also help to keep this situation from escalating. It’s always a good idea to file a police report after any traffic accident. If law enforcement is on their way, you may need to stay calm in the immediate situation and follow appropriate procedures to exchange information. Share contact details and license plate and vehicle make and model numbers and details about insurance. If the other driver, however, becomes violent or if you do not feel safe for any reason, you should always contact the police immediately. If you are unable to make a phone call at the scene due to the other driver’s behavior, ask a witness to contact the police and physically remove yourself from the proximity of other driver. You can use this as your opportunity to contact your own car insurance company and share the details about the accident and how it happened. Be prepared to have your information to exchange quickly and efficiently. If the other driver is already angry and on the way to something and worried about being late, you do not need to inflame the situation by taking too long to provide your details. Of course, you should always still contact law enforcement officials and exchange information so as to be professional and follow good post-accident protocol, but you want to maintain a level and cool head and provide details quickly. If the other driver shares his or her information and has to leave the scene of the accident, you can share this with the police, but make sure you have all the relevant details from the other driver as well. This is a great opportunity for you to take pictures and videos of the scene of the accident as it may be difficult to reconstruct this later on. Immediately after the accident happens is your best chance to remember what occurred and to document it yourself. Taking pictures and videos is a great way to do this, but you might also notice witnesses in the vicinity of the accident who may be able to provide valuable details about what they saw. Get their contact information even if the other driver leaves the scene of the accident. Stay at the scene of the accident as long as you need to, to ensure your own safety and ensure that the vehicle is out of the way of oncoming traffic. The police can advise you more about the next steps you need to take and after you have notified your insurance company about the accident, you should consult with your personal injury lawyer about any other remaining steps that you may need to take. If you have already been injured in a Boca Raton car accident, you need an experienced lawyer you can trust. Do not wait too long to reach out to a lawyer as this could compromise your ability to recover compensation.